I want to know how to personalize email for each recipient on my list using mail merge so that each contact in my list of 5,000 names receives a personal greeting. Does GroupMail have a mail merge feature that will let me personalize my email? Yes, not only does GroupMail allow you to personalize email for each recipient using mail merge fields in the Subject line and body of your email, but you can also use merge scripts that automatically correct instances when a recipient does not have any content in one of the fields that you want to merge. You can even send unique attachments and links to each recipient on your list with GroupMail. You can use insert mail merge fields in the subject line and body of your email. 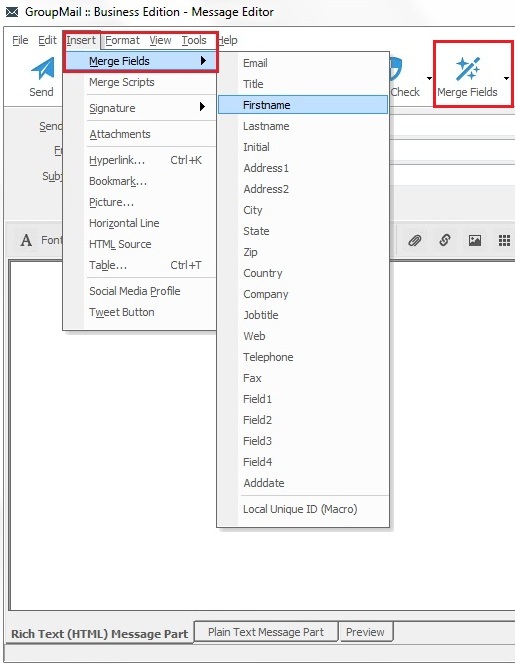 Just click Insert/Merge Fields Menu [or the Merge Fields Icon] and select the database field that you want to personalize for each recipient. The mail merge data that you insert will be replaced by the actual data for each contact on your list when the message is sent. Great question! It is not uncommon for someone to not fill in some of the information you ask for on your email opt-in form. If some of your contacts leave information out, then you can insert mail merge scripts in your email. 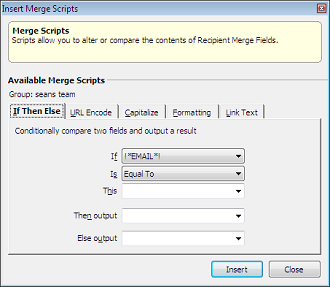 Mail merge scripts allow you to add your own content in place of the merge field if nothing exists in that field for a particular recipient. To add a merge script, just click Insert/Merge Script (instead of Insert/Merge Field) — then, create your IF/THEN/ELSE statement. Interested? Download GroupMail email marketing and newsletter software and start getting personal with your mailing list!